When Corinne Prevot ’13 was four years old, she came home from her Montessori school one day excited about something. Her teachers had asked the class to sew a button on a piece of cloth, an exercise intended to help develop hand-eye coordination and motor skills. Prevot proudly waved her project in front of her mom, who looked at the piece of cloth. The assignment was one button. Prevot had sewn on 20. You might say that was the start of a career. 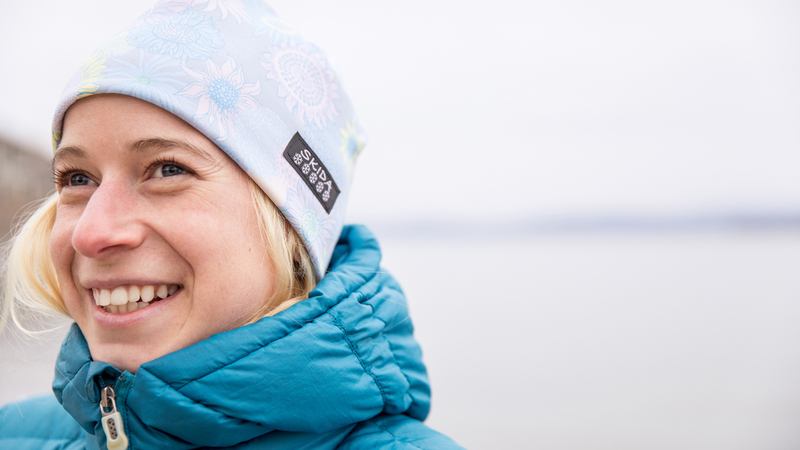 Today, Prevot’s company, Skida, makes fleece-lined hats, headbands, and cold-weather gear in bold prints and colors. What began as a pet project while Prevot was competing as a Nordic ski racer in high school grew into a full-fledged business at Middlebury and is now a hat empire that extends to ski runs and hiking trails all across the country. From buttons on cloth, Prevot graduated to curtains. When she was six, she took eight different prints and sewed them together in strips to make new curtain panels for her bedroom. Another year, she made fleece pants for her family, a cheaper alternative to buying long underwear from Patagonia, and she eventually moved on to making wallets as birthday and holiday presents for friends. But sewing wasn’t her only hobby. The Prevots had a farm, and every weekend, depending on the season, Prevot and her two younger brothers had wood to chop, sheep to shear, or pastures to mow with an old tractor dubbed the Gravely. The family also hiked and took canoe trips, and Prevot’s old photo albums are filled with pictures of her family at the J-bar lift at Burke Mountain in Vermont. Her grandmother lived in Lyndonville, the next town over from Burke, and Prevot’s family would spend time there during holidays and school vacations. It was at Burke that Prevot learned to ski—when she was two—and it was at eight years old that she decided she wanted to one day attend Burke Mountain Academy. Prevot began her time at the ski school competing in alpine but switched to Nordic her sophomore year, when she noticed she had difficulty progressing. A petite skier, Prevot found that her strengths lay with endurance challenges, and had seen other skiers her size switch to Nordic with success. The opportunity to embrace a different angle to the sport was appealing, but it was a change that required a new wardrobe. She had a fleece hat that she liked, but she lost it and had a hard time finding another like it. So one rainy Christmas break, Prevot went to the craft store in Lyndonville, bought some stretchy Lycra fabric, and sewed some hats for herself, her teammates, and her coach. The first Skida hats had gone out into the world. Prevot studied abroad in Kathmandu during the fall semester of her junior year, and one of the first things she noticed when arriving in Nepal was that the men in the country wore colorful patterned hats known as topi. To her, the topi was another version of the hats she was creating for her new company, Skida. Those first few hats she crafted in high school had drawn the attention of just about every other Nordic skier on the interscholastic circuit in the Northeast. Soon other girls on other teams wanted Prevot to make them hats, and by the time she left for college, Prevot was receiving custom orders for ski teams and contracting with home seamstresses in northern Vermont. Middlebury proved to be a great place to expand Skida. During winter term as a first-year, Prevot took the course Middlebury Entrepreneurs, where she learned how to craft a business plan and market products. And while taking a course in cartography, she discovered how to export her e-commerce data and map where her products were being shipped. While in Nepal, Prevot had become fascinated with the cashmere industry and its ancient trade roots, so she studied the supply chain for her research project. (The experience set the foundation for a cashmere line Skida would open a few years later.) And an independent tutorial during the subsequent winter term in 2011 allowed Prevot to develop the Skida [+1] program: for every online order that is submitted with a Skida [+1] promotional code, Skida donates one hat to a corresponding cancer center for patients who are undergoing chemotherapy. In between college classes, Prevot managed the company’s Shopify site, kept up with social media, worked with retailers, picked patterns, ordered fabrics, and packed orders from her space in the Old Stone Mill, where she kept her inventory. And from her apartment above Taste of India, she and her roommate would host parties that consisted of drinking wine and stringing hang tags. Even though she had the space in the mill, the hallway of Prevot’s apartment was filled with plastic bins, and she was spending as much time on her business as her homework. Six years ago, as Prevot started thinking about the future of Skida post-Middlebury, she began making trips to Burlington to scout commercial spaces that could be a good home for the expanding company. Her realtor showed her several spaces in the city’s South End, touting the neighborhood as a thriving community, especially for creative ventures. Prevot was sold, signing a lease for office space in a former cereal factory on Pine Street. But after just a couple of years, Skida began to outgrow its Pine Street digs, and Prevot started looking for a bigger place. One day, while walking up a side street, heading from her office to a park to play kickball, she noticed a redbrick building that she thought would make the perfect Skida HQ. When a spot in the building opened up six months later, Prevot and her realtor convinced the landlord to renovate the space into her dream office. The Skida headquarters are bright and cheerful, consisting of a retail showroom; a deep storeroom for products ready to be shipped as online orders are fulfilled; and an open office layout, where marketers share space with three dogs. Skida is right at home in the South End, in Burlington, which has attracted many outdoor businesses, including Burton, the world’s first snowboarding manufacturing company, as well as favored local retail outlets like Skirack, Outdoor Gear Exchange and the Alpine Shop (all of which sell Skida products). And while Burlington technically isn’t a mountain town, there are numerous ski areas within an hour’s drive. Sleeper has worked for Skida for the past three years, but her ties to the company go back even further, when she worked as a buyer for the Alpine Shop in South Burlington. When a sales position opened at Skida, Sleeper jumped on it. As the director of sales, Sleeper oversees the company’s four sales channels: wholesale to retailers (Skida has 300 across the country that account for about half of their business), e-commerce, custom sales, and the company’s showroom. But as the self-proclaimed “mom” of the office, Sleeper also makes it her job to ensure Prevot eats. Or at least puts her food in the fridge. A hustling entrepreneur forgetting to eat has become a bit of a cliché, but like any cliché there’s more than a hint of truth behind the adage. Between redesigning the company’s website, scheduling social media posts, booking travel for upcoming trade shows, managing a staff of 12, and pushing out 100,000 Vermont-made units of merchandise last year, Prevot has been busy. The company’s offerings have expanded over the years (as you might have expected) to include hats, headbands, and neckwear in performance fabrics (poly-blends that are breathable and moisture wicking, to keep you dry while exercising), in addition to the cashmere collection launched in 2014. Alpine products are lined with midweight fleece, while Nordic products are unlined, making them suitable for warmer months. Production operates in northern Vermont, still supporting local seamstresses, as well as in Nepal, using many of the same factories Prevot researched as a student. Prevot often hears people say that when you see a Skida print you know it’s Skida—the colors are bold, the prints often floral. The company often purchases designs from design libraries or works with artists, but sometimes real-life objects inspire Prevot. A marble bowl on her kitchen counter was behind a pattern Skida will release next year, and there are prints torn from a calendar on her living room floor as well as a vintage floral briefcase sitting on a cabinet that she may turn into designs down the road—although it could be way down the road. Some of the designs incorporated for 2019–20 are four years in the making, as it takes time to acquire original art, recolor, sample, and photograph it. With next year’s products wrapped up, Prevot is ready to dive into the following season. A few years ago, Corinne’s mother, Margie Prevot, who has done Skida’s bookkeeping since the company’s beginnings, was in the produce section at a grocery store in South Burlington. A woman walked by, giving her a funny look. Then the woman stopped, unzipped her sweatshirt to show the same Skida T-shirt Margie was wearing, and held her hand up for a high five. The woman had no idea who Margie was. But Margie says that’s Skida—it connects complete strangers. With retailers from Stowe to Anchorage, Skida’s connections extend to little pockets across the nation (and even to Vancouver in British Columbia). In Park City, Utah, where Olympic cross-country skier Liz Stephen lives, there’s an entire floor-to-ceiling display of new Skida prints at her local ski shop. A member of the U.S. national team from 2006 until 2018 who skied in the World Championships and three Olympics, Stephen is used to spending many hours a day in a hat. She was the first athlete to be sponsored by Skida; the company supported her from 2011 until her retirement in 2018. Stephen wasn’t on the podium during the 2018 Winter Olympics in PyeongChang, but Skida still got the ultimate shout-out. After winning the United States’ first-ever women’s gold medal in the team sprint freestyle cross-country skiing final, athletes Jessie Diggins and Kikkan Randall did an interview with the Today Show wearing Skida tours (convertible fabric tubes that can be worn as neck warmers, headbands, or hats). There are two schools of thought on building a fire. The first involves gathering whatever might be lying around—sticks, pine needles, dry leaves, trash. Throw it in a pile, liberally apply lighter fluid, and toss in a lighted match. The second method is more intentional. You find some dry leaves or grass, then small twigs to shape into a tepee. Strike the match and hold the flame to the dry leaves. When they catch, the flame is drawn up into the twigs. Gradually you put bigger and bigger sticks onto your tepee, and finally, a log. When it catches, you add another log. And another. The first fire, while big, won’t keep you warm for long. Eventually it will die out. The second fire, however, has the potential to burn through the night. Prevot often uses this analogy to talk about how she started Skida—no lighter fluid involved. Eleven years ago, former L.L.Bean CMO Steve Fuller was walking through the parking lot at his son’s ski competition when he saw Burke Mountain Academy’s tent, a clothesline full of Skida hats, and Prevot. Since then, he’s served as a sounding board for her questions ranging from marketing to growing a company. He says it helps that Prevot started Skida in high school and continued in college, when she couldn’t devote all her time to it—the company was only able to grow as fast as Corinne and her mom could let it. To this day, Skida hasn’t taken on any commercial loans or financing but has grown on its own working capital. Last year, Prevot’s business savvy won the attention of Vermont Sen. Patrick Leahy and the Women’s Economic Opportunity Conference, for which she was asked to be the keynote speaker (an honor she considers to be the highlight of her career), and the attention of Forbes, which named her to its 2018 “30 Under 30 for Manufacturing and Industry” list. But that doesn’t mean Skida hasn’t had its share of obstacles—the company faces everything from the occasional winter with low snowfall totals that leaves behind leftover inventory to rising fiber costs in Nepal. And while Skida does produce items like headbands for warmer months, the company relies heavily on its winter sales. Prevot worries about these things, but so far, keeping Skida’s humble beginnings in mind has kept her on course. At least for now. Prevot doesn’t know what’s next for Skida or herself, but she’s OK with the ambiguity. Her spare time is spent in the place that inspired the company to begin with: outside. Whether she’s going for walks around the South End, skiing, camping, or competing in mountain bike races (which she discovered in college as an off-season training exercise), she can usually be found in one of her happy hats. Because Prevot is happy. And she’s created a brand that embodies that spirit. “It’s just a happy product,” Margie says. “It brings people together in the outdoors. If you’re skiing and someone comes toward you wearing a Skida hat, you both look at each other and laugh because you’re part of this community. I’ve never seen anybody do that with another brand’s product.” Burlington is full of opportunities for that laughter, and Prevot’s head is on a constant swivel, whether she’s at the grocery store, walking to lunch, or driving down the street.